"Breaded pork chops with zest of lemon, parsley, and garlic." 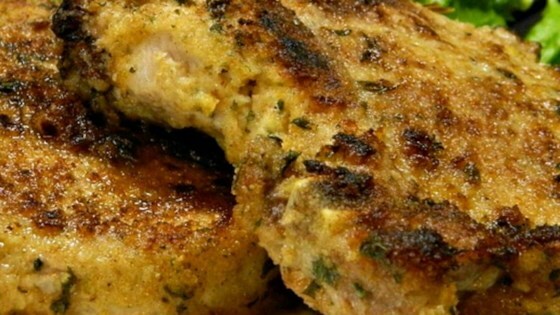 Mix bread crumbs, parsley, garlic, lemon zest, and black pepper in a large bowl; rub onto pork chops to coat completely. Heat olive oil in a skillet over medium-high heat. Fry coated pork chops in hot oil until browned, 2 to 3 minutes per side; transfer to a baking sheet. Bake in preheated oven for 25 minutes, flip, and continue baking until no longer pink in the center, about 25 minutes per side. An instant-read thermometer inserted into the center should read 145 degrees F (63 degrees C). Excellent! Pork chops stayed moist yet crispy on outside!! Substituted lemon pepper seasoning for lemon zest. I’ve made this A few times and it’s delicious!! I added A bit of cayenne pepper for A bit of A kick and it was great!!! These chops were just ok. Still in search of a pork chop recipe that we love. Probably wouldn't make again. Seemed like too much garlic for our tastes so only used a tablespoon of minced garlic for 1.5 cups of crumbs. I also thought to add some seasoned salt. I will make again.